Xenoblade Chronicles 2 was the biggest and most challenging project I have ever worked on. It consisted of a number of processes, including composing (needless to say), acting as a co-ordinator (for recording sessions), a producer (managing budgets) and working as a sound director, managing schedules, proofreading every composer’s scores, finalising/brushing up the scores and printing them all out, looking at the sound controls for Nintendo Switch, etc. I was careful especially in choosing the musicians, and in being efficient in recording sessions as much as possible, Another point to highlight was that musicians from all over the world were involved, such as a chorus from Slovakia, an orchestra from Japan, vocal songs sung by Ms Jen Bird, who came all the way from England, and finally the Irish chorus group ANÚNA. One of ANÚNA’s performances is featured in a music video. All kinds of genres of music were made, so I am sure that the game will not bore you no matter how long you play it. I was invited by the director [Tetsuya] Takahashi (Taka-san) to be involved in the project of Xenoblade Chronicles 2 back on 9th December 2014, which I was very excited about. Three months later, we held a meeting to discuss the direction of the music, and the sound that Taka-san required. Then after a few more months – when the direction and the amount of music were all set – we held another meeting including ACE and [Kenji] Hiramatsu-san to decide who would write for what. Although generally we divided the music equally, I think the decision was made rather smoothly, considering that we wanted the fans to be satisfied, and we did not want to ruin the image that was already set by the first Xenoblade Chronicles. Each composer was in touch directly with Taka-san to communicate about the music they were working on. For some of the demos, I had phone calls from Taka-san, asking for my opinion on the music in question. Then we’d usually have the same thought and agree on something like, “Yeah, maybe that’s not right.” When Taka-san turns down a demo, he tells the composer exactly what is required in a clear way. He does so by putting himself into the composer’s position, and choosing the words he uses wisely, which makes it easy to make any necessary amendments. The first time that I came across the Irish chorus group ANÚNA was from one of their albums released in 1996, called “Deep Dead Blue”. Back then I was totally into the music of Northern Europe, including Finland, Ireland, Scotland and the Mediterranean region. Usually world music consists of a land’s distinctive instruments, whereas ANÚNA found their way of expression through the human voice, which can be considered the original musical instrument. The album “Deep Dead Blue” really left huge impression on me, as the chorus wasn’t like a classical one, nor Gregorian, or Bulgarian… I felt that ANÚNA was a new type of chorus that I’d never heard before. My attention was drawn to the lead singer, Michael McGlynn, and I dreamt about making music with ANÚNA one day. 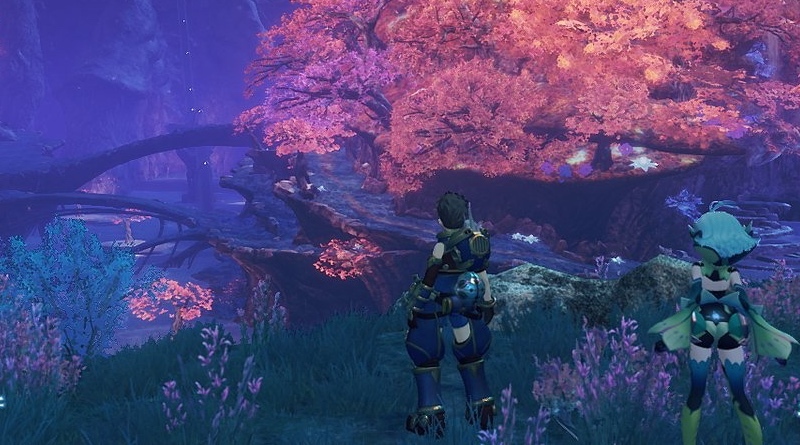 After 20 years, my dream came true through the making of the game Xenoblade Chronicles 2. We recorded four pieces in total, one of which you can see here in a beautiful music video featuring ANÚNA. The piece is called “Shadow of the Lowlands”, and it played in the Kingdom of Tantal in the game. I am sure that it will give you a strange, mysterious sensation whilst walking around the Kingdom of Tantal. Please enjoy playing the game, as I am sure it will give you a totally new feeling that you have never felt before.